DAISY GUNN is determined to nail down a spot in the Great Britain squad for years to come. The 15-year-old has once again been selected in the British junior team for the upcoming year. 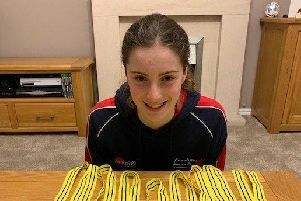 Purbrook Park pupil Gunn has been part of both the English age-group squad and Great Britain junior team for the past 12 months. 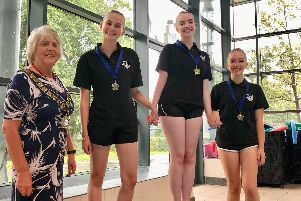 The teenager competed abroad with England this year – taking part in events in Croatia and Spain. She has yet to make her competitive debut for the British squad. But following her 2019 selection, Gunn hopes to make more of an impact. ‘I know this year it will makes things easier because I know what they are looking for,’ she said. ‘Normally it is the same group of girls, so we have built a strong team bond. ‘Being involved with the squad last year helped build my fitness. I feel like I’m a lot fitter now. It was like a training year with Team GB for me. The Great Britain junior squad will take part in a number of international events next year. Gunn is excited at the prospect of more travel. And with the junior and senior squads both based in Bristol, she is keen to catch the eye. Gunn added: ‘For me, next year is about looking at getting to go abroad with the Team GB junior squad and taking part in competitions. ‘At the moment, people are switched in and out of the squad but I’d like to have my own place.